Humans are absorptive creatures. Everything that we are exposed to influences us in some way. Our brains and personalities are like sponges and those of us who pursue creative passions use those sponges to express ourselves. As an artist, I know that my art, much like my personality, is a cocktail of all of my influences. As an avid consumer of media, I am constantly soaking up content. I often get inspired by characters I read about in books, works by other artists, movies that capture me, or songs that I fall in love with. My ideas are formed and contaminated by the world around me. In spite of this, I believe that even if I am a product of my environment, the way I filter the world is unique to me. I guess you could say that curiosity fuels my interest in the works of others, and creativity is the filter through which I produce my own distinctive work. For this specific pop culture contamination project, I blended Lana Del Rey’s song, “Summertime Sadness,” and Sadness from the animated movie, Inside Out. The two combined create a clever play on words and an enchanting character. This piece was all about mixing for me. Along with mixing pop cultural references, I also decided to use a variety of different mediums. Like most good things in life, this project started as a pencil sketch. To define the lines, I used pigment pens and a Sharpie marker. Colored pencils shape the character’s personality helping to depict her trademark blue skin and glistening tears. Summertime is symbolized by a sunhat adorned with a big yellow sunflower. The texture on her hat was created using layers of thick acrylic paint which I scratched repeatedly with a push pin.Where I felt the piece needed more brightness, I added pops of highlights and patterns with white paint and a gel pen. Finally, I mounted the painting on cardstock to create a quasi-framed look. Here’s a snapshot of each stage of the process. I hope you enjoyed reading about the creative process behind this piece. If you have any ideas for more pop culture contamination projects, let me know in the comments section below. I would love to see the combinations that you come up with. As always, thanks so much for following my creative journey! I’m working on a coloring book! 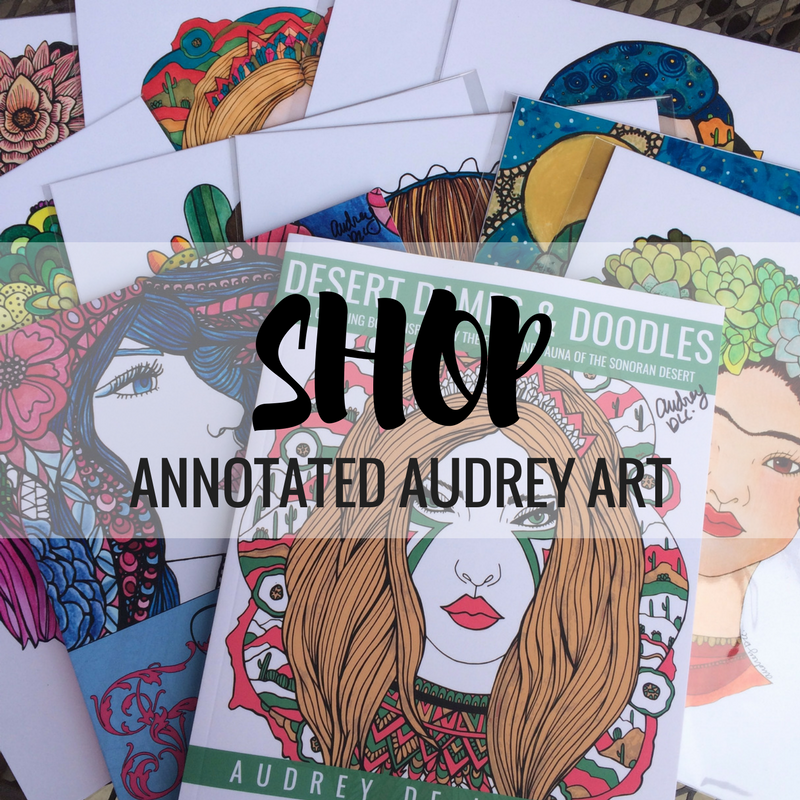 You can see sneak peeks of my coloring book illustrations on Instagram (@annotatedaudrey). How did you do the snapshot of the different stages? That is cool! N.
This is so amazing! I love this!! !